Quote: Reports are coming in from all over the Internet that Windows 10 licenses get revoked on some systems currently and that activation is not available either at the time of writing. The most common issue that users and administrators experience right now is that the activation status of Windows 10 PCs is changed from activated to not activated. Some users reported that Windows 10 Pro product keys were suddenly turned into Windows 10 Home licenses. Quote: We found a Windows 10 Home digital license for this device running Windows 10 Pro. 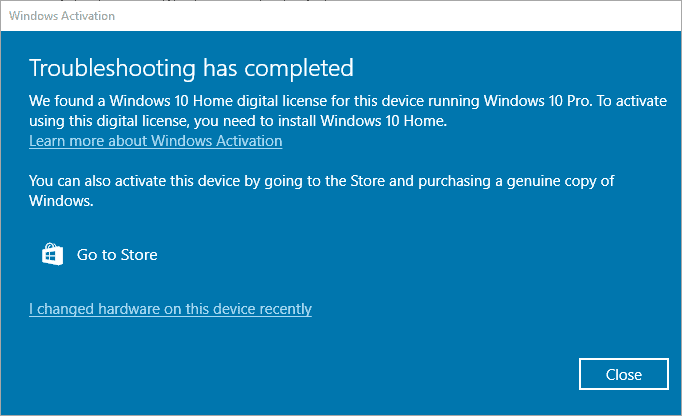 To activate using this digital license, you need to install Windows 10 Home. The message includes links to learn more about Windows Activation, open the Microsoft Store to purchase a genuine copy of Windows, or launch the "hardware change" process. Attempts to activate the operating system again fail at the time. Reinstallation or the installation of backups don't fix the issue either.